For related races, see 1788–89 United States elections. Though no organized political parties yet existed, political opinion loosely divided between those who had more stridently and enthusiastically endorsed ratification of the Constitution, called Federalists or Cosmopolitans, and Anti-Federalists or Localists who had only more reluctantly, skeptically, or conditionally supported, or who had outright opposed, ratification. Both factions supported Washington for President. Limited, primitive political campaigning occurred in states and localities where swaying public opinion might matter. For example in Maryland, a state with a statewide popular vote, unofficial parties campaigned locally, advertising platforms even in German to appeal and drive turnout by a German-speaking rural population. Organizers elsewhere lobbied through public forums, parades, and banquets. No nomination process existed. The framers of the Constitution presumed that Washington would be elected unopposed. For example, Alexander Hamilton spoke for national opinion when in a letter to Washington attempting to persuade him to leave retirement on his farm in Mount Vernon to serve as the first President, he wrote that "...the point of light in which you stand at home and abroad will make an infinite difference in the respectability in which the government will begin its operations in the alternative of your being or not being the head of state." Uncertain was the choice for the vice presidency, which contained no definite job description beyond being the President's designated successor while presiding over the Senate. The Constitution stipulated that the position would be awarded to the runner-up in the Presidential election. Because Washington was from Virginia, then the largest state, many assumed that electors would choose a vice president from a northern state. However, the stipulation that the President and Vice-President must be from different states dates only to the Twelfth Amendment of 1804. In an August 1788 letter, U.S. Minister to France Thomas Jefferson wrote that he considered John Adams and John Hancock, both from Massachusetts, to be the top contenders. 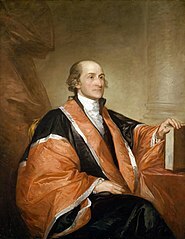 Jefferson suggested John Jay, John Rutledge, and Virginian James Madison as other possible candidates. Voter turnout comprised a low single-digit percentage of the adult population. Though all states allowed some rudimentary form of popular vote, only six ratifying states allowed any form of popular vote specifically for Presidential electors. In most states only white men, and in many only those who owned property, could vote. Free black men could vote in four Northern states, and women could vote in New Jersey until 1807. In some states, there was a nominal religious test for voting. For example, in Massachusetts and Connecticut, the Congregational Church was established, supported by taxes. Though such tests and establishments were outlawed by the new Constitution, the concept of an un-Constitutional law dates to 1803 and incorporation, or application of the Constitution to the states, dates to 1868. However, in 1789, a religious test disenfranchised few among eligible voters. Test acts protected Protestants, sometimes of specific sects, but Catholicism and Judaism were rare in the newly independent United States. Catholicism was confined mainly to a minority in Maryland while both Catholicism and Judaism were further limited to a subset of urban populations in the largest, most cosmopolitan port cities, including Philadelphia, New York, Charleston, and Newport. For example, of 55 delegates to the Constitutional Convention, one from Maryland was Catholic, with the rest Protestant, which was only mildly less diverse than the American population of the time. States where public opinion endorsed such a test typically lacked meaningful religious diversity or a sizable religious minority to oppress by disqualification, and further did not necessarily vigorously enforce the test. Finally, public opinion regardless of gender, race, creed, or even political bias was known to favor Washington to the point of virtual unanimity. Voting was hampered by poor communications and infrastructure and the labor demands imposed by farming. It took two months for Washington to be notified that he had been elected before spending one week traveling from Virginia to New York for inauguration. Similarly, Congress took weeks to assemble. As the electors were selected, politics intruded, and the process was not free of rumors and intrigue. 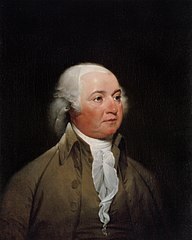 For example, Hamilton aimed to ensure that Adams did not inadvertently tie Washington in the electoral vote. Also, Federalists spread rumors that Anti-Federalists plotted to elect Richard Henry Lee or Patrick Henry President, with George Clinton as vice president. However, Clinton received only three electoral votes. Source: U.S. President National Vote. Our Campaigns. (February 11, 2006). (a) Only six of the 11 states eligible to cast electoral votes chose electors by any form of popular vote. (b) Less than 1.8% of the population voted: the 1790 Census would count a total population of 3.0 million with a free population of 2.4 million and 600,000 slaves in those states casting electoral votes. (g) The identity of this candidate comes from The Documentary History of the First Federal Elections (Gordon DenBoer (ed. ), University of Wisconsin Press, 1984, p. 441). 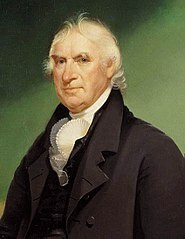 Several respected sources, including the Biographical Directory of the United States Congress and the Political Graveyard, instead show this individual to be James Armstrong of Pennsylvania. However, primary sources, such as the Senate Journal, list only Armstrong's name, not his state. Skeptics observe that Armstrong received his single vote from a Georgia elector. They find this improbable because Armstrong of Pennsylvania was not nationally famous—his public service to that date consisted of being a medical officer during the American Revolution and, at most, a single year as a Pennsylvania judge. (a) New York's legislature did not choose electors on time. ^ See "Alternative methods for choosing electors" under Electoral College. ^ "VP George Clinton". www.senate.gov. Retrieved April 15, 2016. ^ "1789 Presidential Electoral Vote Count". Dave Leip's Atlas of U.S. Presidential Elections. Dave Leip. Retrieved January 14, 2018. DenBoer, Gordon, ed. (1990). The Documentary History of the First Federal Elections, 1788–1790. University of Wisconsin Press. ISBN 978-0-299-06690-1. Ellis, Richard J. (1999). Founding the American Presidency. Rowman & Littlefield. ISBN 978-0-8476-9499-0. McCullough, David (1990). John Adams. Simon & Schuster. ISBN 978-1-4165-7588-7. Meacham, Jon (2012). Thomas Jefferson: The Art of Power. Random House. ISBN 978-1-4000-6766-4. Wikimedia Commons has media related to United States presidential election, 1789. "A Historical Analysis of the Electoral College". The Green Papers. Retrieved February 17, 2005. This page was last edited on 16 April 2019, at 18:29 (UTC).